Are Thoresen perceives demons and other spiritual beings as clearly as we see each other. He sees the demons that cause disease as well as the beings associated with medicinal plants and other substances that can promote health. He has witnessed how demons of disease leave the bodies of the sick and enter the healthy, thus causing contagion. 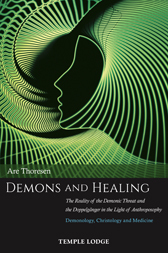 Through his therapeutic work, Thoresen has learned that one cannot simply ‘fight’ demons, as they will ‘translocate’ to other people or return later. The only effective way to counteract these malign entities is to dissolve them through the boundless love of the being of Christ. The author presents a lifetime’s knowledge – the fruit of more than half a century’s practical and clinical experience – in the pages of this book, offering a better understanding of health and disease. He recounts numerous personal experiences of demonic entities and explains how demons are created. Thoresen advises on the prevention of the demonic effects of natural and artificial radiation, and how we can defend and ultimately free ourselves from demonic influence. A fascinating Addendum describes the phenomenon of poltergeists and the spiritual beings related to various drugs. Demons and Healing is a singular work, written out of precise vision and knowledge of the spiritual entities that surround us in everyday life. ARE THORESEN was born in Norway in 1952. A doctor of veterinary medicine, he has also studied anthroposophic medicine, homeopathy, acupuncture, osteopathy and agriculture. Since 1981 he has run a private holistic practise in Sandefjord, Norway, for the healing of small animals and horses, as well as people. He has lectured widely, specializing in veterinary acupuncture, and has published dozens of scholarly articles. In 1984 he started to treat cancer patients, both human and animal, and this work has been the focus of much of his recent research. He is the author of several books on complementary medicine that have been published in various languages.